This family had plenty of space in their home, including a large basement with a spare room adjacent to the main basement they used for their children’s toys. The main basement area housed their pool table, Foosball table, air hockey game, and lounge area. The toy room was where the two boys played Xbox games and kept the Nerf guns and other miscellaneous toys. In addition, all of their Lego creations were on the second floor, in their bedroom. When the husband began to work from home more frequently, the set-up soon began to show its limitations. He worked from a table in the basement, constantly hushing the children so he could focus on his conference calls. Meanwhile, the toy room went largely unused as the boys were drawn to the variety of activities in the basement. 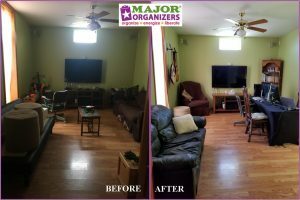 When Major Organizers arrived to help, the Liberator quickly determined that this busy family didn’t need two toy spaces—and no office. The toy room adjacent to the main basement was converted to the dad’s office and a quiet zone for homework. The toys and Xbox were moved into the main basement area – which became the fun zone. All Lego was also moved from the boys’ bedroom to the basement so their bedroom could remain a quiet area for reading and sleeping. Clear boundaries were created for the fun zone and quiet zone – the quiet zone became a place to work, do homework and read. This new configuration has brought peace—and productivity—to the home. The family knows they can go down to the basement to play games and have fun without worrying about being too noisy. The father knows he has a quiet space to work without having to constantly remind the boys to be quiet. By rethinking how they are using their existing space, this family is now enjoying their home—and their time together—more.